by gillian claire: my boys. i found this photo last night while i was going through a bunch of old photos on my computer. it was taken when asher was 7 weeks old. we were spending the evening at our new house before we moved in so that aaron could work on painting. it is so fun to watch these boys grow as brothers. i love it. i love how ever since asher began in my womb - he has been roman's brother. it's part of his identidy. 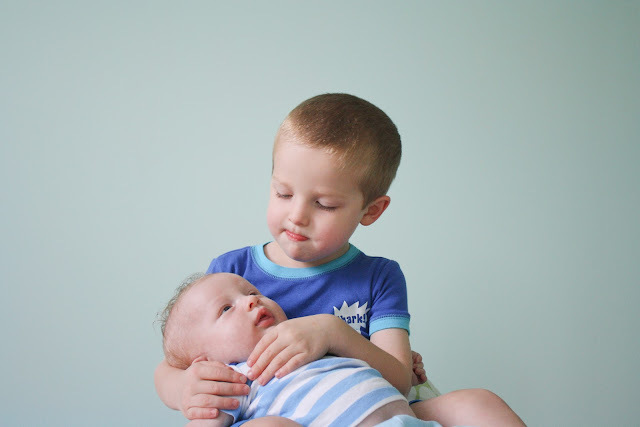 to asher, having roman as a brother will be huge in shaping him as a person. asher ADORES his brother. it is precious to see his face light up when roman first wakes up in the morning. i love how roman says, "it's time for cuddles!" or, "it's broth (as in brother ) play time!" roman tends to get a little too rough with ash, but the funny thing is - asher loves it! i can just see them rough housing and running around like crazy together. asher reminds me so much of roman as a baby. he is determined and active. this little boy is just dying to crawl. he wishes to so badly. gosh, two boys is so much fun! i look forward to every part of raising them together. i always tell my boys how God knew i wanted two little boys - and that is the truth. I want two little boys too, but my husband has his heart set on a girl. I guess we'll just have to wait and see what God blesses us with next!